Comment: Like new, unread.CD/DVD not included.Pristine-Unmarked pages with sturdy binding. Ships directly from Amazon.Eligible for free 2 day/Super saver shipping. Happy readings! 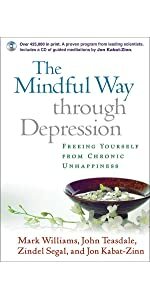 Start reading The Mindful Way through Depression on your Kindle in under a minute. "Williams and his international team of authors provide insight into the healing power of so-called 'awareness' through which people can escape the wearisome ruminations of the obsessed mind, befriend alien feelings, and come more alive in themselves. The book is accompanied by a CD with meditations that can help the listener enter the present moment, own more fully their physical context, and stand back from the flow of their thinking and feeling....A practical volume that bears the authority both of contemporary psychology and the age old spiritual practice of meditation." "An invaluable resource for patients who suffer with depression. In addition to psychotherapy, psychopharmacology and CBT, it provides another resource to patients and another way of looking at their struggle, a way of trying to understand what's happening and a way to learn a technique of self-help; a way of attempting to break through a cycle of chronic unhappiness. The book is accompanied by a CD with a series of guided meditations, making it a unique and useful package for the clinician to use in a comprehensive treatment program....A book of this sort is invaluable in that it provides a series of take-home exercises for the novice and provides a step-by-step guide to patients or clinicians interested in effective noninvasive therapeutic techniques." "The book is well written and easy to read....People who are prone to depression, dysthymia, or general unhappiness will find this a helpful new way to reframe their thinking about their issues, and practitioners may also find it a useful basis for counseling." "Composed by a star-studded team of scientists and practitioners, this powerful book is the best self-help title to arrive since David Burns's seminal Feeling Good. 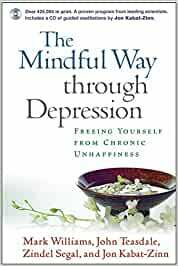 Williams, Teasdale, and Segal previously collaborated on Mindfulness-Based Cognitive Therapy for Depression, a well-received text for mental health professionals. Add to the mix Jon Kabat-Zinn, a luminary in his own right, and the result is a useful lay reader's guide to incorporating mindfulness techniques in everyday life. Providing a realistic eight-week program, this wonderful guide and its accompanying CD offer invaluable practical strategies for banishing depression and regaining one's life. Highly recommended. (starred review)"
How can this book help with self improvement? 5.0 out of 5 starsLight in the darkest tunnel. This book changed my outlook from overwhelming depression (on the brink of suicide) to compassionate understanding of myself. It has provided me ways to heal and to continue living. It is not a quick fix. It took about a year of hard work to get to this state of comfort. Many days I could only read a page or maybe a paragraph, often the book stayed in the bed with me, and the CD in the player on repeat. Highly recommended to anyone, including counsellors. ....too bad i had to become depressed before picking up this book. this book clears up so many issues i've had with meditation/mindfulness, it seems that the authors have researched the concepts and 'figured out' so much of what i was missing in the traditional literature. I cant stop practicing! hahaha. brilliant, and i feel my depression lifting the more i delve into this. 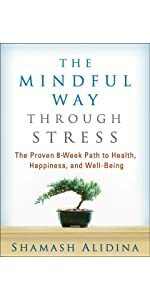 also, it weaves mindfulness/meditation into the latest research on emotions, avoidance, etc., something i had be 'onboard with' for a while (being a fan of EFT, for example), but mastering these methods may well be the right vehicle for delivering access to primary emotions, and transforming maladaptive ones. amazing book and experience. the accompanying cd, can be 'abandoned'... something i had to do as i got better at the practice. 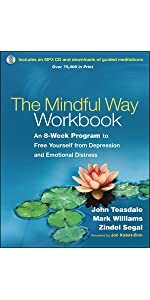 I have been working through The Mindful Way through Depression and accompanying 8 week workbook on mindfulness. It’s all about becoming aware of your response to negative things and the tendency to respond with trying to fix it (fight) or avoid it (flight). So it applies to depression, anxiety, stress and lots of other negative reactions to the things that happen to you. The goal is to learn to meditate and hold your tense body sensations and negative thinking patterns and desire to continue avoiding in a new “awareness” and stay with it until you crest the crisis of anxious feelings and start coming down the other side. Once you are on the other side, you realize that you are okay, that you can face these things and survive. This builds your resilience and positive outlook. Slowly of course, but it works. I love this book. It is currently being used as a basis for a Mindfulness Program for the Adult Mental Health Department in the hospital where I live. I use the CD daily. The program is changing my life for the better. I am the Queen of Rumination. I have chronic insomnia and using this program is helping me at this point to catch and name what I am doing, living in my head rather than simply being in the present moment. The more of the present I miss the faster life goes. This book is helping reclaim my life, this moment, this present, this breath, for this is all I truly have. I am so grateful to be led to this book. 5.0 out of 5 starsIf you really want peace this is the book for you! If you really want peace and help with this nasty disease this is the book for you! Excellent book for depression sufferers. It will help overcome the dark thoughts and brain chatter that keep depressives spinning in the circle of despair. There really is a drug free way out of this disease. The writer is clear and the science is supportive of the methods and pathology. Best book on the topic I have read. I love this book because first and foremost it just confirms that what I think and how I think it is not totally crazy. 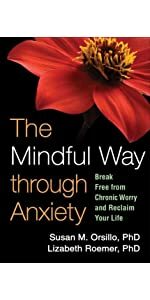 This book doesn't promise to offer some magic cure but to minimize your thoughts and anxiety by allowing you to take a step back and see how your attempts to force yourself to feel better actually can make it worse. I will always keep this book by my bed and re-read it as a reminder of how I can identify thoughts that only amplify my bad feelings and not punish myself for feeling bad. Plenty of exercises and information in an easy to read style that helps you centre yourself before spinning out of control in moments of stress and diving down that rabbit hole we tend to go into when overwhelmed. A very practical book. Easy to read and follow. Lots of strategies you can practice right away.